CVS Health is in talks with health insurer Aetna about a possible acquisition. The deal would value Aetna at around $US66 billion ($AU86 billion), or roughly $US200 ($AU261) per share. The news comes less than a year after a judge blocked Aetna’s attempt to acquire rival insurer Humana on anti-competitive grounds. CVS Health, the retail pharmacy giant, is in talks to purchase Aetna, one of the five large publicly-traded health insurance companies, according to a new report. 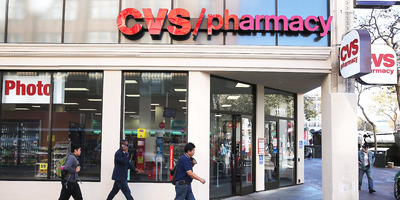 The Wall Street Journal’s Dana Mattioli reported that CVS offered more than $US200 per share of Aetna, which was currently at $US160 a share before the news broke. The deal would be worth around $US66 billion according to the report. Aetna previously agreed to buy rival insurer Humana for $US37 billion, but that deal was blocked by the Department of Justice. A judge ruled in favour of the DOJ in January, saying that the combination of the two companies would have been anti-competitive. A spokesperson for CVS was not immediately available for comment. Following the news, Aetna shares jumped around 11.5% to $US178.60 a share as of 4:15 p.m. ET. CVS shares slipped by roughly 3% to $US72.60 a share.